M and his Mum, Di, collected our Shropshire based Dawes Super Galaxy tandems at the end of June 2018. At the end of August Di wrote, "I have picked M up from school several times before he broke up for the summer. We have cycled locally to parks. We have done half day trips & a full day trip on national cycle route 55 starting at Telford Town park & riding to the River Seven, where we had a picnic. Then along the river on route 45 to Iron Bridge for an Ice Cream, then up through Coalbrookdale before turning East and joining back up with route 55 & heading back to Telford Town Park. Route 55 is a great ride. With reasonable surfaces & the section we did was mostly down hill. M loved the speeds we got up to, but also helped on the up hill return route getting us home. By the time we were on the last mile he was tired & his head was resting on my back. He had a great day. Zara's fiancé, Simon, collected one of our Dursley based Claud Butler in late June 2018. More details and a photo are to follow. Daniella and her husband, our new North-East Helper, Carl, had our North-East based Dawes Discovery tandem for a few weeks from late June 2018. Neve and her Mum, Julie, collected our Glasgow based Viking Valhalla in late June 2018. Julie wrote on our Facebook site, "Maiden voyage and no one fell off! Looking forward to some girlie expeditions for cake. Still some way to go to have confidence she isn’t going to fall off but we’re on our way. 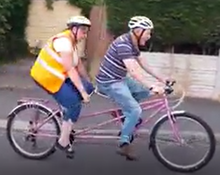 Can’t thank you enough Charlotte’s Tandems"
Pauline and Chris used to have their own tandem but, due to her leg problem, she can't ride it anymore. Here they are collecting our Dursley based Viking Companion tandems in late June 2018. She finds this much easier due to the low step over. Cosmos and his Mum, Daisy, collected one of our Edinburgh based tag-alongs in late June 2018. Daisy said on our Facebook site in mid-July, "Cosmos is loving the rides we’re doing in our local woods." Sandy and his parents collected one of our tag-along trikes in late June 2018. His Mum, Ally, wrote on our Facebook site, "He loves it, thank you so much for lending it to us." 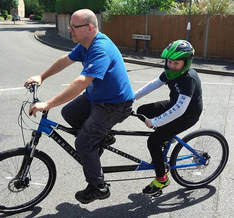 Josh and his family collected our brand new Simmonsohn tandem in late June 2018. Mum, Lisa, wrote on our Facebook site, "Not bad for his first try. Just collected from Ilana in Woking. Thank you so much. — feeling excited." Anne and her friend, John, collected our brand new Viking Pink Link tandem in mid-June 2018. See a video of them in action on our Facebook site. Ian and one of his Scouting friends collected our Yorkshire based grey KHS Sausage Dog tandem in mid-June 2018. 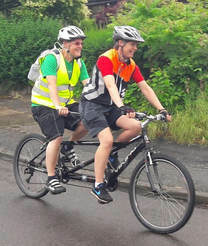 At the start of August they wrote, "We haven't been out on the tandem as much as I would like, but we’re planning a long run this weekend, which I’m looking forward to immensely. I must say that I’ve forgotten how difficult it can be to get a bike to go up a hill." He later said on our Facebook site, "It was great fun, freedom of the road. Thank you to everyone at Charlotte's Tandems"
Marcus and his Mum, Susanna, collected our Surrey based Viking Saratoga in mid-June 2018. They had previously borrowed a tag-along bike from us back in 2014. 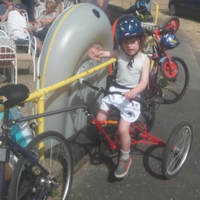 Sus wrote on our Facebook site this time the next day, "Marcus loved taking it out today along the Basingstoke canal and we enjoyed a stress free family bike ride on Father's Day . Thank you so much. Looking forward to lots more rides over the next couple of months." Martha and her family collected one of our Sussex based Viking Companion tandems in mid-June 2018. Here she is on the test ride with her Dad, Simon. 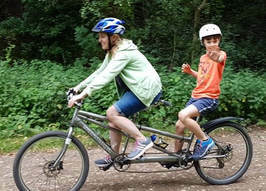 Robert and his family collected our Surrey based Viking Valhalla tandem in mid-June 2018. 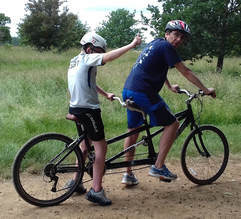 His Mum, Carloyn wrote soon after, "Here is a photo of Gary & Robert on the tandem in Windsor Great Park, close to our home, familiarising themselves with the tandem we have just borrowed from your Surrey Helper Ilana. Hopefully we will have a lot of fun on it." Guy and his friend, also called Guy, collected our brand new Cheshire based Orbit Velocity tandem in mid-June 2018. They are to ride from London to Paris and will send a photo at the Eiffel Tower. Adam and his family collected our Cheshire based Burley Samba tandem in mid-June 2018. His Mum, Lorraine, wrote on our Facebook site at the start of August, "This is the first time our around the block. He loved it and is very proud." 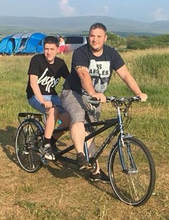 Owen and his Dad, Darren, collected our Lancashire based Dawes Duet tandem in early June 2018. Here they are on their "first small ride". 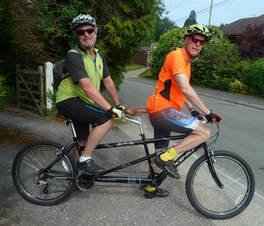 Martin and Neale collected one of our Sussex based Viking Saratoga tandems in early June 2018. 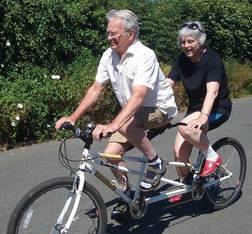 Charlie, our Helper, wrote on Facebook that they were taking the tandem "out for a spin before heading off home for more rides along the South Coast." Diane and her family collected one of our Dursley based Richmond tandems in early June 2018. 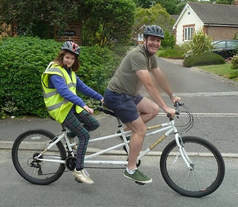 She has her own tandem but wanted to try one of our fast tandems, for racing. She said in July, "We went out on the bike within the first week on the local cycle path. 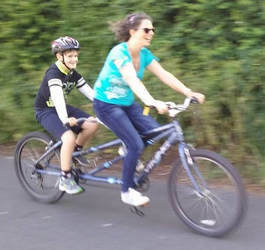 It was quite scary as it was much faster than my own tandem"
Joshua and his Mum, Helen, collected one of our Dursley based Viking Salerno tandems in early June 2018. He couldn't wait to take it home and show it off to his friends. Rob and is daughter, Diane, collected our Cheshire based Viking Valhalla tandem at the start of June 2018. Brian wrote on our Facebook site, "Diane and her Dad, Rob, who is V I, collected a Cheshire Viking in the rain. Now off to W Kirby for coffee. Dedication or what? Rob has local friends who are happy to be pilots for him. Top borrowers."